New Horizon School (NHS) an unaided Minority Institution was established by World Education and Development Organisation (WEDO), with a purpose of producing excellent human beings with excellent academic standard clubbed with our cultural and religious knowledge. 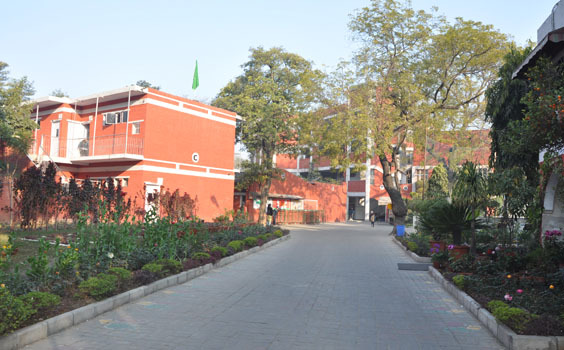 The School is located amidst lush green and sprawling fields adjacent to Humayun's Tomb in Hazrat Nizamuddin. Our primary aim has been to impart modern education and to incorporate nationalist thinking based on Indian culture and Islamic traditions. There has been a conscious effort to bring our children close to diverse Indian culture through various activities which will enable them to appreciate and respect Indian culture as a whole and take pride in calling themselves a true Muslim and a proud Indian. Our aim is to inculcate a strong sense of responsibility, both physical and moral ,in order to build a value system based on quality education, whereby our students would feel confident in facing the complexities of the world which is fast shrinking to a global village due to the rapid globalisation. With a view to inculcate a strong bond between culture,religion and value of life we have made COMPUTER EDUCATION mandatory for all classes starting from class I itself..
Begun with 22 Students and 2 teachers in 1978-79, the School has reached Senior Secondary level offering multiple streams and wide choice of subjects. NHS has been producing one of the best results in Secondary and Senior Secondary classes ever since its inception. URDU is compulsory for all students from Class I onwards. Being a co-ed institution, NHS encourages girl students for admission. The school is fully equipped with all necessary infrastructure required for a modern school. There are two Computer Labs, one each for Junior and Senior sections. Computer education is compulsory till Xth standard & in XI, XII students study computer as per their choice of stream. NHS is one of the pioneer schools in having initiated computer education. It is a must for all the faculties to be computer and internet savvy.